Children’s Week is an annual event celebrated in Australia during the fourth week in October, and focuses the attention of the wider community on children, their needs, and achievements. One such need is dental hygiene. It is never too early to encourage healthy dental hygiene for kids. Nearly half of all 6 year olds having some decay in their baby and adult teeth, according to the Australian Institute of Health and Welfare. In some cases, severe tooth decay can result in tooth loss. The good news is that tooth decay is completely preventable. So what can you do to establish good dental health and hygiene for your child? It is as easy as following some basic guidelines, and A Supa Smile would like to share them with you. Healthy dental habits in children take time to develop, but the learning process in children is quicker in the early years than any other period in life. Forming healthy habits at a very young age is vital to the child’s growth and overall well-being. As soon as when the first tooth starts to come in, you can encourage good dental habits by increasing your child’s familiarity with the toothbrush. Even before this, it is a good habit to brush the gums of your infant with damp gauze or a soft, damp washcloth, to keep bacteria down. Brushing is crucial from the start. When your baby’s teeth appear, brush twice a day with an infant toothbrush and toothpaste. Start flossing when any two teeth touch each other. Be sure to take time and show your child how to properly floss, emphasize the importance of flossing and explain what can happen if they don’t take care of their teeth! Regular check-ups are a foundation of good dental care. They should begin before a child’s first birthday. Dental check-ups can prevent later dental problems and detect any bad dental habits or other issues at their earliest stages when they’re easier to treat. Make sure to take your child for dental check-ups twice a year to give them a head start on a healthy smile. Be sure to model healthy behavior, by staying current on your own dental cleanings, and explaining that children need more dental appointments because their teeth are still growing and maturing. Thumb sucking is so common that many parents think they have no choice but to wait until their child outgrows it. But if it becomes a regular habit, it can cause teeth to shift forward and misalign their bite. This can lead to later problems with talking, pronunciation, chewing, and cleaning that require orthodontic treatment. In addition, thumb sucking can introduce bacteria into the mouth. Don’t put your toddler or older child down for a nap or for sleep with a bottle of juice, formula, or milk. Sugary liquids cling to his teeth, feeding bacteria that can cause tooth decay. 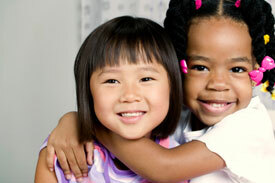 If your child begins to associate dental care with other good things, they’re more likely to stick with it. Create a system that rewards them for their hard work and effort. Make a calendar and post it with stickers each day your child brushes and flosses. At the end of the month, give them an award for success! At A Supa Smile our warm, caring, and detail oriented dental team provides a wide range of children’s dental services to ensure that your child develops and maintains beautiful, healthy teeth. With proper and consistent dental treatment, not only do we help prevent cavities in the future, we teach your child good habits that will last them a lifetime! The CDBS is a government funded health program providing $700, over two years, to cover basic dental services for nearly 3 million Australian children between the ages of 2 and 17 who might otherwise go without. Eligible children should not miss out on the CDBS’s benefit for basic dental services. Your child’s health is key to their future, and good oral health is a gateway to good overall health. If you have any questions about the Child Dental Benefits Schedule please get in touch with our staff. If you have a child in need of treatment, or any other dental issues, do not hesitate to call us on (03) 9723 0703. We’re open from Monday to Saturday to cater to all your dental needs.